« This is the Reel Deal. 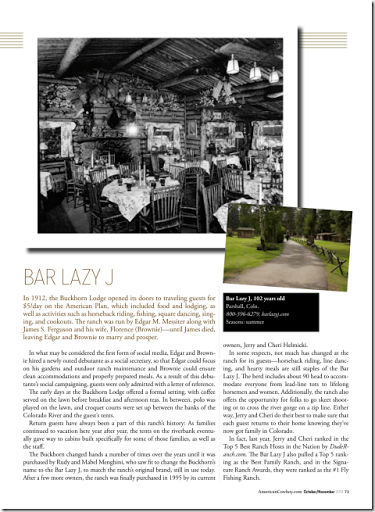 What an honor it was to be featured first in American Cowboy magazine’s “10 Historic Western Hideaways” this Fall! The article highlights the ranch’s rich history and present day status as one of the leading guest ranches in the country. “In 1912, the Buckhorn Lodge opened its doors to traveling guests for $5/day on the American Plan, which included food and lodging, as well as activities such as horseback riding, fishing, square dancing, singing, and cookouts.” Hmmmm…..well the rates have changed (sorry folks), but the service and activities haven’t strayed too far from their origins. Perhaps the biggest change is that polo is no longer played on the lawn and guests no longer need a reference letter in order to come stay with us! Ha! One thing is for certain, they captured the feel of this place and our favorite line would have to be, “… Jerry and Cheri do their best to make sure that each guest returns to their home knowing they’ve now got family in Colorado.” They nailed it! 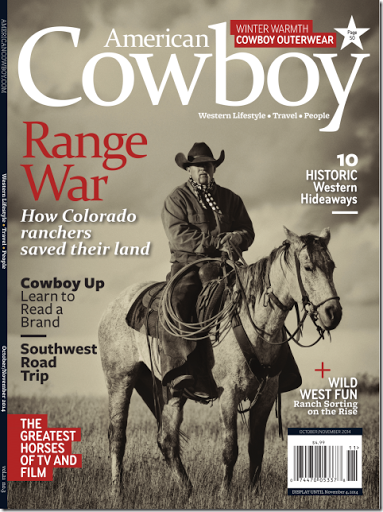 Thanks for the nod American Cowboy magazine—from our cowboys and cowgirls to yours!